A lifetime ago one of my fellow students at art college was a street artist. This was a long time before it was known as “street art,” though. Back then it was simply called, positively and negatively, graffiti. Almost thirty years later street art remains a controversial art form, often prohibited and often still created under the cover of night. Yet during those intervening years street art has also emerged blinking into the commercial mainstream. The works of international pioneers Keith Haring and Jean-Michel Basquiat are posthumously displayed in museums and galleries and sell for huge amounts, and Banksy’s work seems everywhere despite–and perhaps because of–his (or her) continued anonymity. While street art influences art and design worldwide it manages to stay true to its urban roots, connected literally and intrinsically with the inner-city streets and environments. Not least in Dutch cities, where it thrives as a vibrant part of urban life… officially and unofficially. For a relatively small nation, the Netherlands’ impact on the world of art is undeniably huge. And the national creative character, while aware and respectful of its past, has never stood still. This is no more apparent than in the art we can see on our streets. If we know the right places to look. Which is where passionate street art evangelists, like Amsterdam Street Art Museum’s Anna Stolyarova, come in. 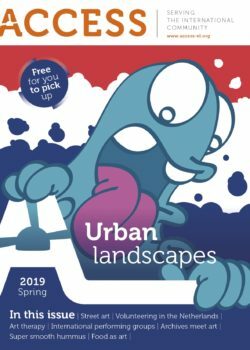 For Anna, and Alexandra Elroy–who wrote our cover story–the connection with the urban environment gives street art its relevance. More importantly, street art builds communities, for both the artists and in city neighbourhoods which might otherwise be overlooked. While Rembrandt is rightly being celebrated this year–the anniversary of his death–across the Netherlands, it’s good to remember that art is not only oil on canvas and in museums. It could be around your street corner. Elsewhere, Nancy Kroonenberg examines the type of art that is presented in a bowl or on a plate, created from one of the amazing recipes in the Rijksmuseum Cookbook. We also see how art can have a therapeutic effect, which Carolyn Vines examines in our Health & Wellbeing section; or be a media for expressing the expat experience–detailed in the fabulous book put together by our friends at the Expat Archive, Saudade: An Intersection of Archives and Art. Tracey Taylor has spoken to five international organisations across the Netherlands who use performing arts to entertain, educates and motivate, and in our travel article, Kim McClure takes us on a trip to Breda, where spring seems to be the best time to visit, not least because of the jazz festival and art fair. Finding the right, or appropriate, school for our kids is paramount for many internationals, and in Education, Ute Limacher-Riebold looks at the difference between international and local schools and reasons why parents choose either. And in Dutch Lifestyle, Tory DeBasso found that for many Dutch people volunteering is a constant, valuable, part of life. Something that we at ACCESS hold to be true too. Which is we are proud of our new feature that shines a light on the ACCESS family. In the first of these articles, Olivia van den Broek-Neri speaks to volunteers from each of our helpdesks, key to the way ACCESS assists internationals throughout the Netherlands.